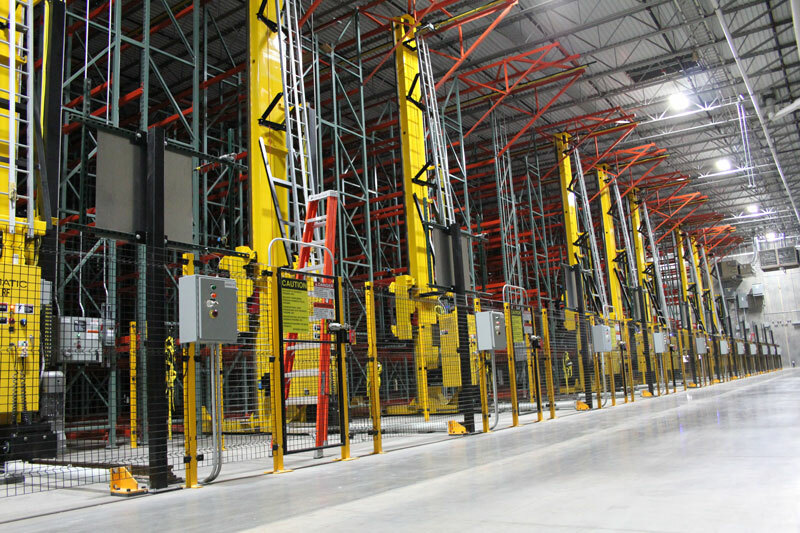 AS/RS Systems, Automated Storage and Retrieval are a common installation in the U.S. now, using computer controlled systems instead of manual labor to store and retrieve pallets in distribution centers. The pallet rack for an AS/RS system must be manufactured to exact tolerances. AS/RS systems offer reduced labor costs because automated guided vehicles, AGV’s, are directed by computers to a picking location. Because the typical AS/RS system moves so quickly there are virtually no humans inside the picking area and minimal lighting. Because of the AGV and AS/RS crane’s picking accuracy these systems lead to reduced labor, more accurate tracking of inventory and space savings. Computers determine the best storage option within the AS/RS system and the optimal retrieval path. Pallets or loads are taken from stored positions directly to loading areas automatically in the most efficient method possible. This creates a seamless link to order processing from the picking and processing details to the shipment of product. Since everything within the AS/RS system is computer controlled all data for where a load is stored and how long it has been stored in that position can be analyzed to help control inventory quantities and accuracy. This control can maximize the space in the warehouse and can lead to a smaller footprint saving valuable space lease dollars allows the money to be spent on automation rolex replica. Many customers are surprised at the actual costs of an AS/RS system when all of the math is complete. The 60+ years of engineering experience and pallet rack design at UNARCO can support the most efficient AS/RS automation system. To find out if AS/RS systems can meet your warehouse or distribution center needs visit “Is AS/RS right for me?” For more general information on UNARCO AS/RS systems visit Automated Storage and Retrieval Systems.